The most likely replacement candidates— Yahoo and Microsoft —have already spoken with Apple's Eddy Cue about replacing Google, according to Amir Efrati of The Information. It was said that Cue's decision is "likely to be based on the quality of the product as much as the potential money made from search ads." Apple already replaced Google in Siri with the launch of iOS 7 in 2013. Since then, default search results have come from Microsoft's Bing, though users can audibly request the virtual personal assistant to "search Google" if they so choose. As for Yahoo, CEO Marissa Mayer publicly stated earlier this year that she wants Apple to ditch Google as the default iOS search engine. She recently successfully negotiated a deal with Mozilla to make Yahoo the default provider in its Firefox browser. Apple, meanwhile, has been steadily removing Google services as default options from its iOS platform. While iPhones previously shipped with Google Maps, Apple famously —and controversially —switched to its own proprietary mapping solution in 2012. In addition, YouTube is no longer a native iOS app. Microsoft was said to be in talks with Apple to make Bing the default iPhone search engine as far back as 2010. 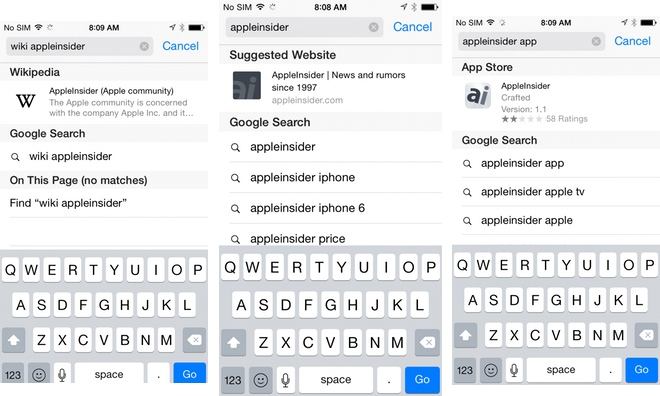 Users can change their iOS Safari search engine to Yahoo, Bing and DuckDuckGo if they choose, but out of the box the browser will default to Google. The rift between Google and Apple began to escalate when the search giant unveiled Android, entering it into the smartphone market to compete with the iPhone and eventually into the tablet space to take on the iPad. Apple co-founder Steve Jobs was incensed by Google's moves, vowing to "go thermonuclear" to destroy Android, which he viewed as a "stolen product."